Sorry that I'm posting later than usual this week. I saw my hubby off to a big health conference in New York City this morning (everyone else was flying to Mexico! ), and just got home a while ago. 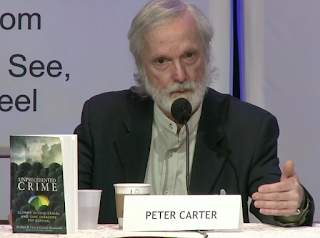 Peter will be speaking on The Global Climate Change Emergency: From Personal to Planetary Health, and then joining a panel that includes one of his greatest heroes, the preeminent climate scientist, Dr. James Hansen, who wrote the foreword to Peter's book (co-authored with Elizabeth Woodworth), Unprecedented Crime: Climate Science Denial and Game Changers for Survival. More and more municipal governments are declaring the climate change emergency — which is a declaration of their intention to spend money doing something to safeguard the future for their citizens.